Cut beef from bone and slice in short strips. Make broth from bone. When ready, pour broth into clay pot, add meat, and simmer in medium oven for half an hour. Slice onion in rings and fry until yellow. In the meantime cube potatoes and add to soup and now continue cooking on top of stove over low flame. In ten minutes add fried onions, and five minutes later the wine, bay leaf, parsley, dill and simmer another two minutes. 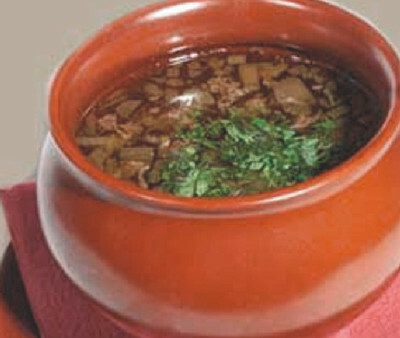 Russian Pokhlyobka looks well served in wooden bowls and eaten with wooden spoons.